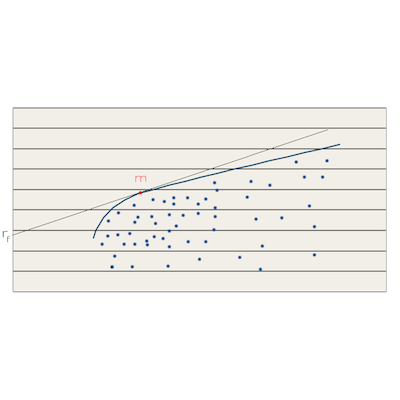 In the first two articles of the Unique Risk series, we explored some interesting portfolio theory but didn’t discuss any practical application of the theory. In this, the final article of the Unique Risk series, we will bring together everything discussed so far and describe how the ideas can be applied to your investments. As you recall, the examples used in the first two articles were based on a two-asset portfolio. As we already discussed, a two-asset portfolio still carries with it a great deal of unique risk that should be diversified away. 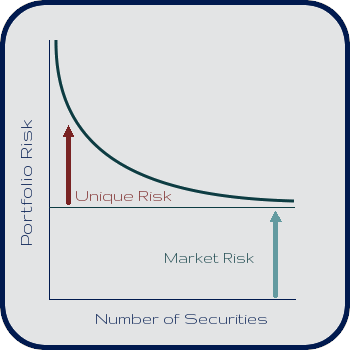 As the above graph from the first article illustrates, adding more assets to your portfolio decreases the unique risk of your portfolio. So what is the best way to diversify your portfolio to eliminate unique risk completely? Let’s create a graph, similar to the graph we made in the previous article, but instead of the graph only representing a two-asset portfolio, let’s graph portfolios containing all of the stocks in the market. Just as with the two-asset portfolio, there are combinations of assets that are more efficient than others. 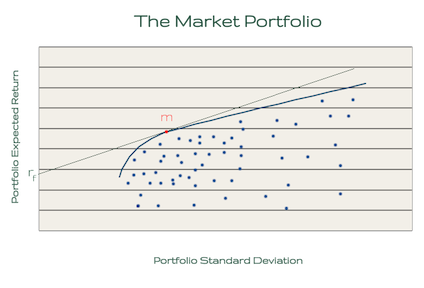 The dots represent portfolios that aren’t efficient and the curved line represents the efficient portfolios. Remember, an efficient portfolio is one whose expected return can’t increase without also increasing the standard deviation (i.e. risk) of the portfolio. Bonus: Personal Capital automatically calculates where your portfolio falls on the efficient frontier graph so sign up for a free account here and see how efficient your portfolio is! Let’s also assume, as we did in the previous article, that there is a risk-free asset available to investors that allows lending and borrowing at the risk-free rate (this is labeled rf on the graph). As was described in the previous article, it’s better to invest in the efficient portfolio that’s tangent to the risk-free rate line (and then lend or borrow at the risk-free rate, as necessary) than it is to invest in a different efficient portfolio or a non-efficient portfolio. It turns out, the point of tangency between the risk-free line and the efficient portfolio frontier of all available assets, labeled m in the graph above, is actually the market portfolio (i.e. the weighted average of all the assets in the market)! Therefore, what the theory concludes is that investors should invest in the market portfolio and then lend or borrow at the risk-free rate in order to obtain the highest expected return with the desired level of risk exposure. By investing in every stock in the market, you are able to eliminate unique risk, thus leaving yourself exposed only to market risk! Market portfolio. Risk-free asset. Aren’t these all just theoretical ideas? Yes, but there are close analogs in the real investing world. The easiest way to invest in the market portfolio is not to go out and buy every stock in the market. Companies like Vanguard have already done the hard work for you and offer total stock market index funds to invest in. The even better news is, they actually charge very low fees for this service so you get the benefits of diversification without having to pay a lot of money in management or transaction fees! How about the risk-free asset? While the risk-free asset is just a theoretical financial instrument, there are risk-almost-free assets that come close. Short-term US Treasuries, for example, probably come closest because they are backed by the US government and carry very little risk of default. So to wrap up this series, in the first article we learned that diversification is beneficial because it allows you to decrease the amount of unique risk your portfolio is exposed to while potentially increasing your expected returns. In the second article, we investigated how different ratios of assets are better than others and described why it is better to invest in efficient portfolios and then use the risk-free asset to adjust portfolio risk to desired levels, rather than investing in non-efficient portfolios. Finally, in the last article of the series, we discussed how the market portfolio is the ideal efficient portfolio to invest in because it eliminates unique risk completely. In order to keep this series (somewhat) concise, I wasn’t able to fully explain some of the theory behind these ideas. If you are interested, you should read about the Capital Asset Pricing Model (a.k.a. the CAPM) to really get your hands dirty. Get Rich Slowly – Index Funds: The Investment Answer? There are many benefits to this approach so I will likely come back to this topic to explain some of the other benefits in the future but I thought focusing on unique risk was a good starting point because it was a good excuse to geek out with some math, graphs, and financial theory! I must mention that I’m not a professional financial advisor so, as always, please do your own due diligence before making any investment decisions. If I left anything out or if you have any questions, feel free to ask in the comments below! 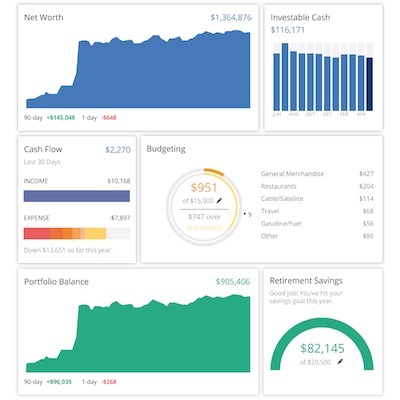 Personal Capital is a free and powerful online investment manager that beautifully presents the most important information about your portfolio! Oh wow. YouTube comments are always painful, but it’s amazing how tailored the pain is for the video content. That Warren Buffett video is filled with comments for various investing websites and payday loans. I get so spoiled around here with intelligent and thoughtful comments so I’m usually shocked and appalled when I venture out and read comments on other articles/videos/etc. Simplicity and already covered to an extent with total us stock market. I think they will use other funds too, and I understand that you can’t sell and rebuy the same fund if your goal is tax loss harvesting. But I still feel I’ll have a better balance in my current portfolio, which will get me closer to the minimum variance. I have limited knowledge on the subject and wonder if you have an opinion on this? Do you think the tax loss harvesting and rebalancing makes up for the added expense ratio and the slightly higher variance? (Crappy question I know since you’ve already chose betterment). Sorry for the long bad english comment. Sorry I hadn’t read through comments on your betterment post yet, but now I have and you somewhat answered my questions already. No problem, Jeremy. Let me know if you still have questions that weren’t answered in the comments. But how does an individual borrow at the risk free rate to lever up on the tangent line? My question exactly. Yes, I see how you could buy short-term treasuries, but since I’m not the US government, I don’t see how I could sell them. Maybe sell them short? But that seems to be a lot riskier strategy then “risk free asset” would seem to imply. Save us, Mad Fientist! Hey, I don’t think I’ve ever seen an answer to this. My impression is that very large trading firms can get close to borrowing at the risk-free rate, on margin. The best margin rates I’ve found are at Interactive Brokers. Right now (May 2018) you can borrow at 3.2%. excellent and detailed information! My question about diversification is not about the security (stock) but the type of investment. I have a Betterment account (Vanguard index funds), a regular stock trading account (which I review and work on every day), a life insurance (locked in for 5 more years), a relatively large saving account, a 401K and IRA and a couple of other things. I even own a rental property (which is paid off). Should consolidate everything in, say, one large Betterment account (with the exception of the 401K probably)? or should I continue managing these multiple accounts for the sake of diversification? You don’t really get much diversification from owning funds in different places. If Betterment disappears, you still own the Vanguard funds, and through them the individual stocks in your regular stock trading account, your 401(k), and your IRA. The only one that (to the best of my knowledge) is not something you can get through the other resources is your life insurance policy, and those are usually very poor investments (insurance policies are not investments, except in rare theoretical circumstances which I think don’t ever come up in real life. That’s not to say you should never have any insurance, but it’s almost always better to think of it more as paying for a service than as an investment). What does the market portfolio mean when, in real life, the risk-free rate isn’t actually a thing? Even with US Treasury bonds (which usually still have inflation risk), it is hard to borrow at the risk-free rate, so if you want a higher return and higher variance, shouldn’t you go to a higher point on the Efficient Frontier than what you identified as the market portfolio? Also, are the weights of individual stocks in Vanguard funds (or the indexes they track) chosen match some point on the efficient frontier (even if it isn’t the point I would choose)? They seem to care more about market coverage than owning the right ratios of everything. I’m fairly sure I couldn’t do a better job manually, especially given trading fees, but I’d like to know how much they fall short (if at all) to the theoretical best. Hey, it’ s really helpful to me but I still have a problem: Would an investor prefer to hold one of the minimum variance portfolios or the market portfolio? I have one question (I am from the UK btw). Are we talking about GLOBAL vanguard funds (ie the WHOLE stock market) or is the the domestic US stockmarket? I have held VWRL in the past when I was Bogling. Some ETF suggestions would be much appreciated!